Often rated as one of the most influential figures in contemporary British culture, Russell T Davies is now perhaps best known as the mastermind behind the smash-hit revival of Doctor Who. In fact, his remarkable TV career stretches back over twenty years, taking in major dramas including Queer as Folk, Bob & Rose and The Second Coming. 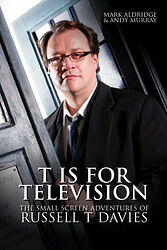 This is the first book to trace Davies' entire life in television from his earliest days to his vast current success. Drawing on several years' research, this book reveals a wealth of information on everything from the writer's most celebrated works to abandoned Queer as Folk spin-off Misfits, forgotten fantasy soap Springhill and even his fleeting involvement with Play School and Chucklevision. Never before published material includes an extensive interview with Davies himself, as well as several of his most important collaborators including Nicola Shindler, Phil Collinson, Paul Cornell and Frank Cottrell Boyce.